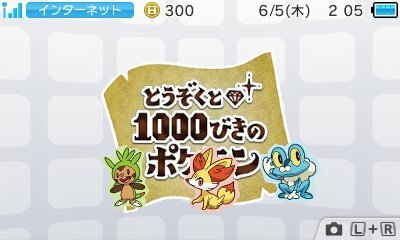 The Band of Thieves & 1000 Pokémon is a piece of download software for Nintendo 3DS to be released on the Nintendo eShop on June 5th 2014 for a limited time. This game makes full use of the StreetPass feature to the point that you can only access the other two starter Pokémon through StreetPassing with other players. This game also has a special event that can only be accessed through going to the cinema to see the movie, Diancie and the Cocoon of Destruction. When the mission is complete, it gives a special code to access something in Pokémon X & Y.